Th-INK-ing of You: Happy Birthday Kelley! The Sticks in the Bread basket have gotten together a little blog hop for Kelley showing her some cards that are coming her way real soon! I recently had the privilege of visiting Kelley at the Our Daily Bread designs booth at the Anderson, SC Heirloom Stamp Show. While we were admiring the booth, she mentioned that some of the sample cards were starting to look faded and could use some updating. Well Kelley's wish is my command and on the way home I started planning.... and since her birthday is today, this is what we came up with! So.... Kelley, here is the card I made for you with this "I Wait for the Lord" set. It's my first time playing with the set but I hope it will look bright and shiny on your display boards because it's really a great set! The base is Bazzill, the dp is BasicGrey Jovial and the Paper Studio Gold textured dp. I used Spellbinders Lacey Circles, Nellie's Scalloped Rectangles, laced sparkly green ribbon through the Nellies Frame, and added gold beads and diamond glaze to the candles. The image is colored with Copics and highlighted with a Sharpie White Paint Pen. Next time I'll use the colors of the Advent Wreath Candles, but this time I wanted them neutral. Hope you like it! Seems funny making a Christmas Card for your birthday... but LOL.... this was what I thought you'd like. From here, please hop to Sandee, Randi and Connie! Happy Birthday Kelley!!! May God richly bless you in the year ahead!!! We luv ya!!! I think it is perfect, love all the layers to make this image pop. That is a beautiful card, Grace!! Kelley will be delighted by all of the DT's thoughtfulness!! Thank you Grace for this idea and sharing withthe rest of the breadsticks. This is such a holiday card, I am going to make some Xmas cards today because of your inspiratio, thanks. I love it and need that set!! Oh gorgeous, gorgeous, gorgeous! Love all of the rich colors and gold. Have a blessed Thursday! mmmm, beautiful Grace! and thanks for a great hop too!! This is a GORGEOUS Christmas Creation! Sooo pretty and so many beautiful details. Thank you for all of your work and help with everything!!! You are a blessing! Grace this is so beautiful!!!! I love the papers and that gorgeous frame! Kelley's gonna be so excited! Hi Grace, thank you for such a wonderful treat for us as well as Kelley. I am loving this sweet gift. Your card is just beautiful. I love how you colored the pine cones. They catch the light beautifully. It will be great on the boards at the shows. oh how gorgeous! i love that frame and the image is stunning! you won my challenge. please check glitterbabe's challenge to see how to claim your prize. thank you so much for joining us in the challenge. hope to see you back soon. Really nice ideas. This card is beautiful. WOW Grace, this is stunning!!! What beautiful colouring and the papers and design are fantastic!!! Kelley will love it for sure!! What a gorgeous card, Grace! I love the colors and the dp is wonderful. Kelley will love it! Fabulous job! This is just so elegant and stunning Grace!! I so love the gold accents and the dp and layout!! Gorgeous coloring of one of my fave images!! What a sweet thing to do for her birthday.. I LOVE what you did with your dies.. This is such a pretty set Grace.. Great job.. One of my favorite Christmas things is each Sunday lighting the Advent Wreath at church.. Great job. Beautiful card Grace!!! I love the set you used!!! Also love the frames and the dp you used as well :) I know kelley will love your card, and all the other beautiful cards ive seen so far! What a gorgeous card with all the layers and colors! I hope Kelley has a fabulous blessed birthday!! and I LOVE your cards Grace and the music on the background of your blog!! This is so very beautiful, Grace! I just made my first card using this image! Beautiful coloring and design! Hugs and blessings! I think it is so special that all of you are gifting Kelley with these gorgeous cards and allowing us to see your wonderful creations too. 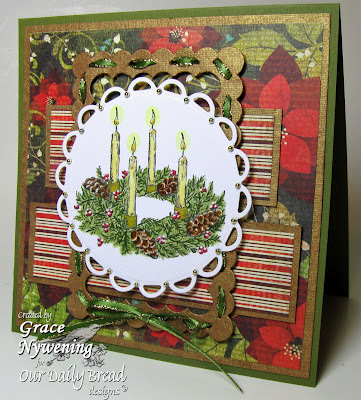 I love this advent wreath card you've made - your colouring is perfect. Love the ribbon treatment. Grace, as usual, very lovely! Thanks for sharing! What a beautiful card! I love this image! Love the way you used layering w/ different styles! Just beautiful Grace, I love everthing about it. So rich and beautiful! Kelly will love this for her new display. Great creation! Just love this card - really neat idea threading the ribbon.. Beautiful! I always love your cards and this is no exception. Thank yu for sharing, what a wonderful way to make a bithrday special. Grace, I love this set too, but oddly it is our least popular set...LOL!! It sure speaks to me, reminding of us about Jesus coming to save us! Your card is so awesome! Love the colors and layers. Thanks so much for organizing this amazing birthday gift for me. It has meant so much to me!! Hugs!! Very pretty! The layout and your framing are wonderful. You are such a Sweetheart to have organized all of these new designs for Kelley's birthday! Your card is beautiful! I love my advent wreath, it seems that many people do not use them at any of the churches I visited along my way! I love how elegant your card is. Your coloring of the wreath is so beautiful. I love all of the die cuts being layered above a few different design papers. This is wonderful!